Here’s a recent address for the Armenia/Georgia Mission. We try to keep this information up to date, but it’s a good idea to check the mission address with several sources, including your mission packet or the mission office. Here’s a list of LDS missionary blogs for the Armenia/Georgia Mission. This blog list includes the missionary’s name, URL and when their mission blog was updated. Here are Armenia/Georgia Mission Groups- for LDS missionary moms, returned missionaries, mission presidents and other alumni of the Armenia/Georgia Mission. Here are T-shirts for the Armenia/Georgia Mission! 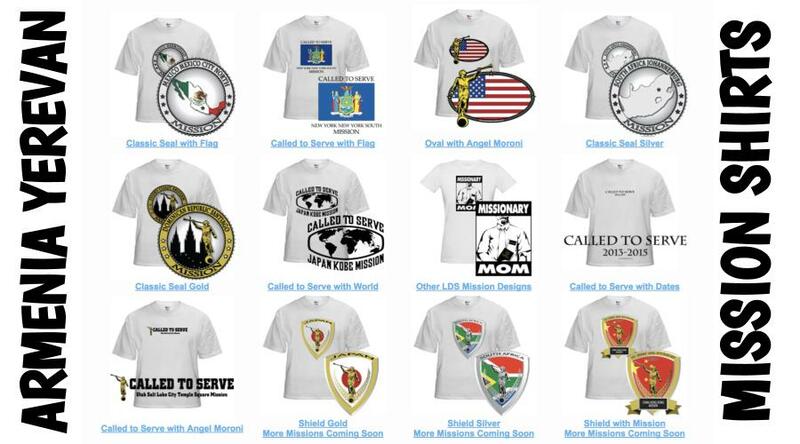 Shirt designs include Armenia/Georgia Mission logo/emblem shirts and Called to Serve shirts. The shirts make great gifts for pre-missionaries, returned missionaries and missionaries currently serving. LDS Mission shirts come in all sizes: Small, Medium, Large, Extra Large, up to 4XL. The mission designs are printed on white shirts and are shipped to you. *Simply click on a shirt design to view the details and submit an order. The designs on mission t-shirts may also be printed on other LDS mission gifts, including: Armenia/Georgia missionary aprons, Christmas stockings, ties, pillow cases, teddy bears and Christmas ornaments. Here’s a list of current and past Mission Presidents of the Armenia/Georgia LDS Mission. Here are survey responses from Armenia/Georgia RMs, to give you a snapshot into what it’s like to live in the mission. 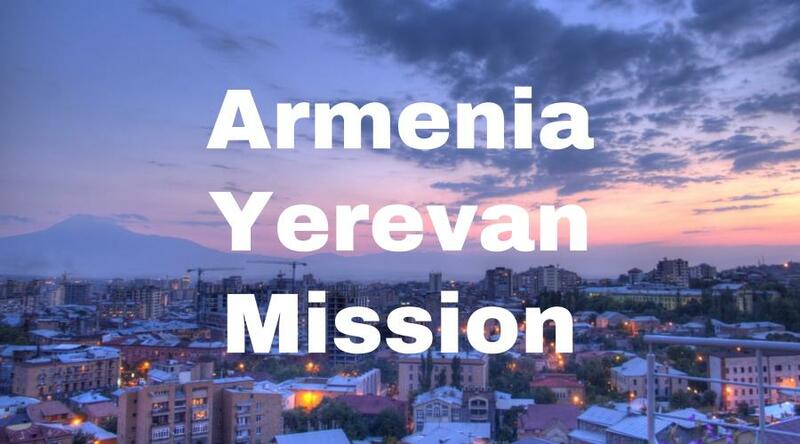 What are some interesting facts about the Yerevan Mission? Any advice/testimony for pre-missionaries going to Yerevan? Armenia was a communist nation and part of the Soviet Union. It has strong roots in Christianity. Being part of the Soviet Union was a huge road block to religion in the country. Churches were destroyed and they had to practice their faith privately. It was really prepared for the gospel. They had a culture of faith that they couldn’t express for decades. When the Soviet Union fell, there was a huge earthquake in Armenia and thousands of people were killed. There were a lot of people that donated. One of them was John Huntsman. He donated a lot and built a concrete factory in the country. That was kind of the foothold for how the Church got started. People still remember John Huntsman’s name there and that gave the Armenians a feel for what the members were like. When the missionaries started there there were so many people that wanted to hear the word of the Lord. I think there were 9 branches started over that time. It had it’s ups and downs, but over these last five years the Church has made eastern Europe to really take its place in the gathering of Israel. There is so much faith. There is now a stake there. There had been two districts and right when I got there they merged those two districts for the purpose of becoming a stake. They merged some branches as well. I had the privilege of seeing those branches grow. There were so many functions performed by the missionaries when I first started. They have a stake president and a patriarch now that are all Armenians. They were pioneers. They picked it up and devoted so much of their lives to it. The Church would not be what it is without the sacrifice of those members. It took about 20 years to get that first stake, but they have the goal of getting their second stake in just 4 more. The church started in Georgia later than it did in Armenia. There was a member from the U.S. that traveled through Russia to Georgia. She did some humanitarian work and was able to get used fire trucks to Georgia. The president and his wife became favorable to the Church and that led to us being recognized there as a church. Religion is super interesting in Armenia. It was the first Christian nation. They were the first to declare Christianity as their national religion. They’re very loyal to the Armenian Apostolic Church. It’s become more of a cultural thing. Their church is so ingrained in their culture and it has kept them alive all of these years. They’ve had a lot of persecution and they are surrounded by a lot of Muslim countries. There was the Armenian genocide that happened for religious reasons and they have held so strong to their religion through all of that. They believe so strongly in Christ, but it’s also difficult coming to them with our message because they see themselves as the most Christian nation. I know that John Huntsman’s father funded a lot of humanitarian work in Armenia and helped the country a lot. Because of that, the country let our missionaries come. The mission was created in 1998, so it’s a pretty young mission and the church is pretty young there. It started whit 15-20 really devoted members that were found. Some of them are still alive today and are the leaders of the church today. There is a man who is the first counselor in the stake presidency that helped with the translation of the book of Mormon. That’s how a lot of the cities in Armenia were started in the church. They found a few key families that were converted and became the strength of the church in that area. It’s interesting because there area a lot of Armenians that are so devoted to there church so they don’t love us initially. Typically they think we are Jehovah’s Witnesses, but they do love us because we’re american or just because that’s what they do as Armenians. They will invite you over and give you all of their food and tell you that they don’t like your church. I think that the commitments that are hard for them to keep are similar in other parts of the world. It stems from a lack of faith in Christ or a lack of conversion and can be solved by helping them receive spiritual experiences through prayer or studying the book of Mormon or coming to church. There are certain commitments such as the word of Wisdom that are hard to keep. Having a marriage license is a hard thing for them becuase it’s expensive. The church has been in Armenia for about 23 years, since the Soviet Union Collapsed. It started in 1989 when John Huntsman, a church member, donated and went to the nation to help rebuild. This allowed the church to eventually be brought in. The work started when the land was dedicated, and at first only missionary couples who could only speak English did the work. In June of 2013, the first stake in Armenia was created. Often times we don’t understand how blessed we are to have the church organized, while in Armenia the church and the members are still learning. They just now are having bishops, a stake president, a patriarch, and more. Now members have access to the blessings of the Priesthood and of a patriarchal blessing. The closest temple is in Ukraine, but it is very far. It takes them about 3 days by bus to get there. It is a huge sacrifice for them to be able to go to the temple and access those blessings.